As can be seen, the crutch arm is meant to have a round hole which fits onto the brass hub that mounts on the anchor arbor. This particular mechanism had led a hard life: I suspect the hub was not original to the crutch arm, and someone had made a new arbor, which did not fit well. The resultant connection between the hub and the arm was flexible enough that it contributed to keeping the mechanism from running. That and someone had filed the pallets, shifted the pivot point for the anchor arbor, bent several pivots… Well, let’s just say there were lots of reasons it couldn’t run. The first step was to remove the previously applied solder. Heating the hub with a small butane torch allowed the two pieces to be separated – inserting a tooth pick into the hub as soon as the flame was withdrawn made it easier to remove the hub from the arm. Lightly reheating the end of the separated crutch arm made it possible to wipe the excess solder away with a piece of cloth. As mentioned in the safety section, wear a leather glove when wiping away excess solder with a piece of cloth to keep from getting burnt. An Exacto knife was then used to trim off residual solder that did not come off with the cloth. Small files or sandpaper can also be used to remove residual solder. 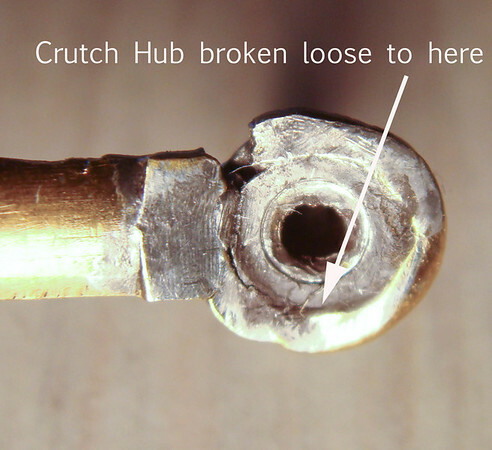 As shown in Figure 1, the original repairer did not do a good job of fitting the hole in the end of the arm to the hub. It was possible to gently bend the rim of the hole such that the end of the rim touched the point where it was broken from the arm. Chucking up the hub in a jewelers lathe allowed me to cut off the excess solder and adjust the hub’s diameter so that it fit the hole in the end of the arm. Figure 2 shows the final fitment. Please note – the pictures in this article are nearly all shot through a 10 power microscope – the outside diameter of the ring on the end of the crutch is just 5 mm, or less than a quarter of an inch. The imperfections you see are truly very fine.